HEALTHCARE COVERAGE: A UNIVERSAL RIGHT? How can you get involved as a Belgian citizen? Find out more about our activities in Belgium and abroad. A well-developed healthcare insurance system is considered a cornerstone for a good healthcare system.  It is the only way for patients to enjoy required care without having to suffer too heavy a financial burden. Public authorities determine how much of the healthcare insurance system they finance, to what extent the population has to contribute and who is exempt of contributing. The idea of ‘free care for all’, which was popular in the past, has turned out to be impractical. Such a type of system indeed jeopardizes the quality of care if the third-party contributor is late with contributing, or stops reimbursing costs altogether, whilst the system also unburdens users from their share of responsibility. By paying a contribution one can claim responsibility and one becomes entitled to claim quality of care. 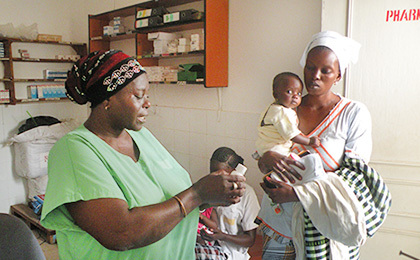 Through its health programmes in Senegal, Benin, Rwanda, Burundi, Niger and Uganda, Enabel helps policy makers to put in place Universal Health Coverage in their respective countries. The healthcare systems in these countries primarily suffer from two problems: The quality of care is below standard and care is expensive for patients. 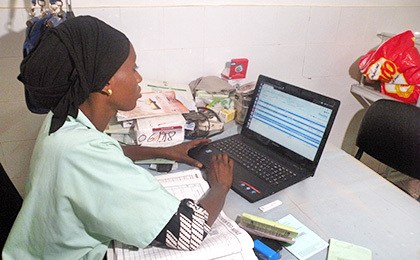 The health interventions of the Belgian Development Cooperation are increasingly focusing on two axes: Improving the quality of care whilst changing the financing system of the sector in order to guarantee financial access to care. The final goal is to create a universal public health insurance of which all members of society can benefit. 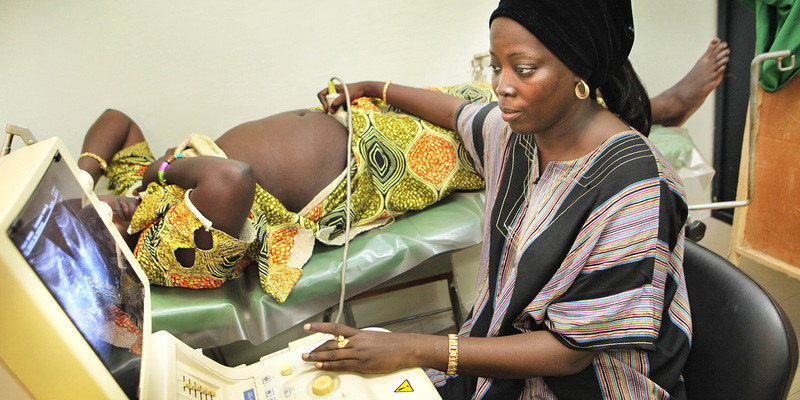 The Government of Senegal has adopted the Universal Health Coverage programme in order to reduce the unequal access to health care. The objective of the programme is to obtain health coverage for at least 75% of the population in 2017, with special attention paid to rural and informal sector populations. But, how to improve the population's health if health care is not accessible to the majority of the population for financial reasons? 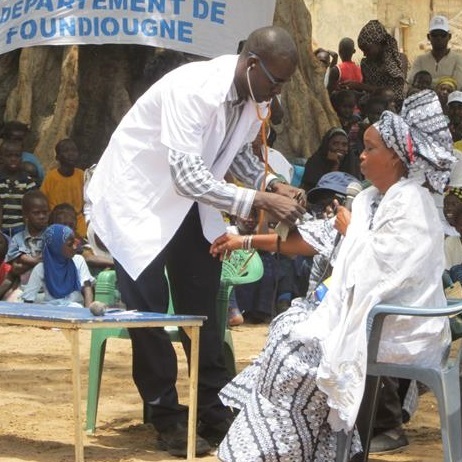 Since 2011, Enabel supports the Ministry of Health and Social Action in achieving this sweeping enterprise in the five regions of the Bassin Arachidier (Diourbel, Fatick, Kaffrine, Kaolack and Thiès). To improve the health of the people of Senegal. 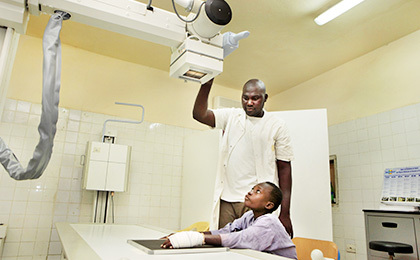 The Belgian-Senegalese health programme supports both offer (quality of care) and demand (better access of care). It aims to guarantee access to health care to the population while committing to a quality improvement process in the functioning, planning and organisation of the 28 health districts concerned. Each of these benefits from technical and financial support. Pilot projects are being set up in certain districts to test a type of organisation and functioning that could be applied to a Universal Health Coverage model at the scale of the country. 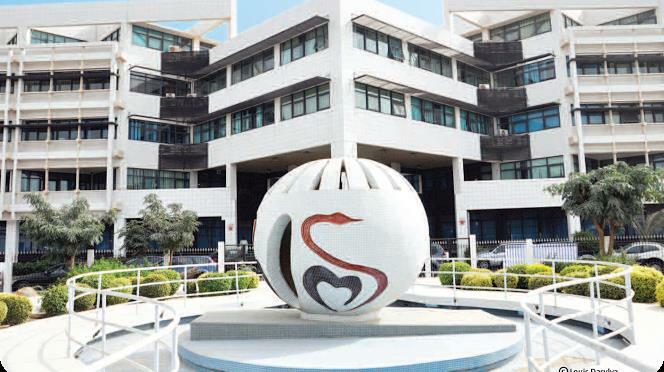 The Ministry of Health, under impulse of the President, demanded support from the Belgian Development Cooperation in order to offer quality health care to all in Senegal. Under this framework, Enabel pilots two experiments that aim to develop and test models in view of developing a National Public Health Insurance: Putting in place a lump-sum payment system for health care and a professional health insurance at the departmental level. Report (in French with Dutch subtitles): Meet the doctors, nurses, midwives, women and community mentors (‘badjenu Gox’). Pilot experiments are carried out and innovative tools tested in support of the reform of healthcare financing and the improvement of healthcare services.  Lump-sum tariffs are tested in order to improve the management of healthcare entities, the forecast of revenues and the costs for the patient. Find out more! A healthcare insurance is tested in two departments to improve financial access of the populations to healthcare services. Find out more! Health and administrative buildings are rehabilitated and equipped to contribute to better service delivery. Find out more! Tools are developed to improve the quality of information, medical care of the patient and the financial follow-up by the insurance company. Find out more! Improved healthcare offer is triggered by the lump-sum tariff system put in place and by the development of a large-scale healthcare insurance which brings about profound reforms in financing modalities of health care. This upsets the whole of the healthcare system and is an essential step towards developing an obligatory health insurance, which is a first step towards Universal Health Coverage. This double experience, benefiting the 5 regions of intervention, has allowed establishing, on account of the Ministry, an implementation model and scenario for the reform. This will allow the authorities to apply the model to the whole of the country. On 31 December 2016, 100,441inhabitants of the Koungheul and Foundiougne departments benefit from health insurance. 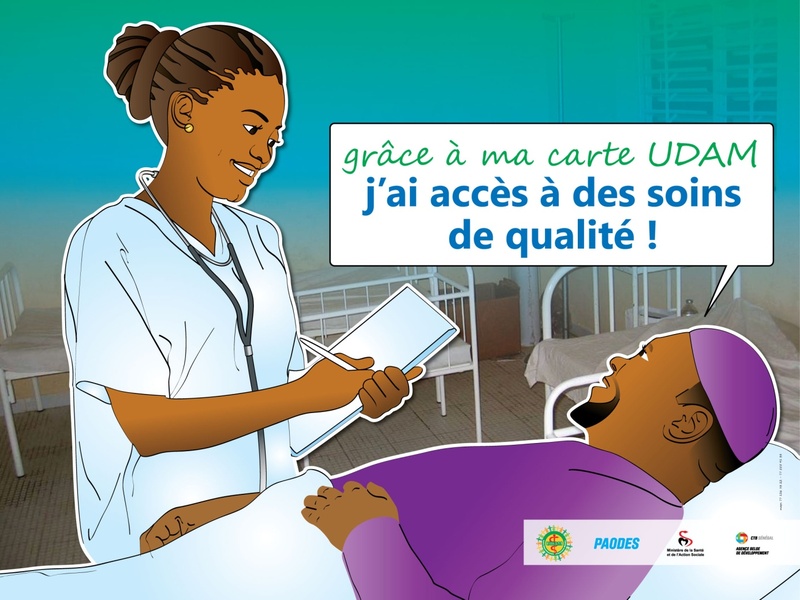 Step by step, the population covered and the package of reimbursed care is expanded to eventually come to Universal Health Coverage for all in Senegal. The first pilot initiative set up a lump-sum subsidised payment system. This system replaces the fee-for-service system, which had proved limited. The fee-for-service provider tends to performs useless medical examinations and to proscribe too much medication... in view of generating greater revenue. The lump-sum tariff, instead, corresponds to the average actual cost of an episode of care. It includes the entire treatment: consultation, hospitalisation, additional examinations (radio, echo, lab…) as well as treatment. 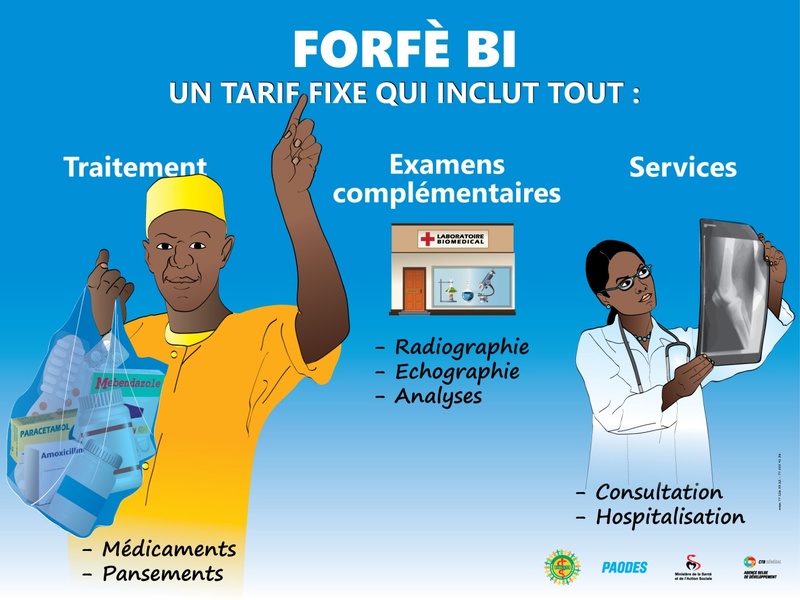 Because the qualifications and quality of the resources required for patient care at the health centre level, compared to the health station level, the tariffs applied for the health centre are significantly higher. This system allows avoiding superfluous care and medication, while better and transparently forecasting costs for patients. Management becomes more efficient thanks to simple accounting and clinical and organisational procedures. Poster informing the population of the advantages of a lump-sum tariff system. To put in place such a system and make it financially accessible, a subsidised tariff system of the health centre (small hospital) was tested. The patient is encouraged to first consult the nurse at the health station (where primary consultation and care are dispensed) and, where considered necessary, further referral is possible to the health centre, where a doctor can be consulted and the patient can be hospitalised. So, a doctor is only relied on when actually necessary. The patient who has followed such an itinerary can benefit from a subsidy and pays only a part of the lump-sum tariff. Such measure aims to rationalise the use of the available resources by first using the first level of the health pyramid, allowing the doctor to concentrate on heavier cases. The subsidised lump-sum tariff system leads to changes in how services, staff and medication are managed. It represents an essential stage in the development of Universal Health Coverage in that it defines which service packages must be insured considering content and cost.  This system comes with other measures that aim to improve the quality of care in the management of medication, the follow-up of clinical protocols, staff management, surgery and obstetric practices, etc. In Senegal, only 20% of the population benefit from health coverage, which leaves the bulk of the population on its own when it comes to health care. 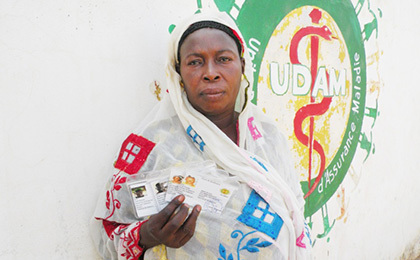 Small community-based initiatives, through which villagers contribute to a small ‘mutual’ savings account, lack professional management and medical know-how and are too small to really protect their members in case of sickness. The second pilot initiative of Enabel therefore put in place a health insurance system at the scale of the two departments of Koungheul (163,542 inhabitants) and Foundiougne (276,222 inhabitants). These Departmental health insurance units (UDAM) are professionally managed by staff recruited for their competences and working on a full-time basis. They use digital tools for managing large databases. The Departmental health insurance unit (UDAM) manages the contributions of the members. It also administers for the State the various exemption mechanisms such as the free-of-charge service delivery for beneficiaries of family security grants. It allows for additional insurance for children up to 5 years, now covered by a free-of-charge programme. In practice, membership is voluntary through a contribution to the account of the health insurance. The Enabel project transfers a complementary sum. This effort should be taken up by the State at a later stage.  The health insurance instance contracts the health stations and centres, and reimburses, after verifying the invoices, the healthcare services offered by them. Members pay a small, rather symbolic sum at the time of consultation. The health insurance instance reimburses a package of activities of the health station as well as the package of complementary activities of the health centre, as defined by the Ministry. These packages cover most care, but exclude certain specific services which, for now, cost too much to be financed by the insurance. All these activities fall under agreements concluded by the health insurance provider and the health districts, and their cost corresponds to lump-sum tariffs put in place in the pilot districts. Foundiougne - The population is informed through drama about the advantages of the health insurance and the lump-sum tariff, explaining how to become a member of the insurance. More than 7.5 million euros are invested in infrastructure and equipment. 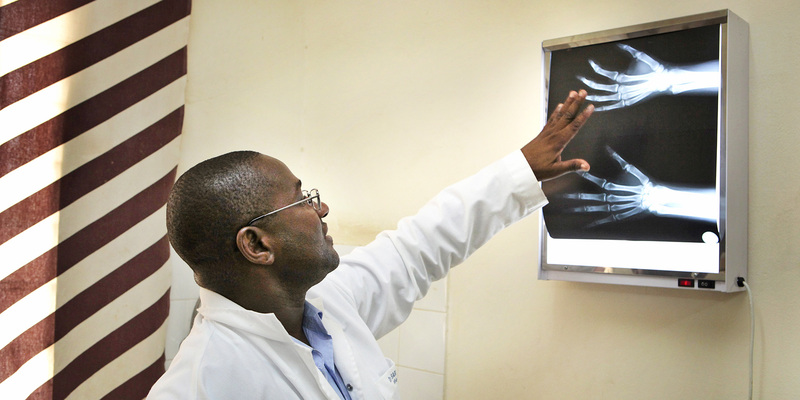 The success of Universal Health Coverage definitely depends on the ownership of the healthcare financing systems. But, how to convince the population to invest in health insurance if the healthcare services offered are failing? In addition to the healthcare offer and demand, the health programme covers equipment and the realisation and rehabilitation of health and administrative buildings. An equipment investment of 3 million euros allowed certain health stations, health centres and administrations of the 5 health regions supported to obtain medical equipment (instruments, ambulances, radiology, dentistry and ophthalmology equipment...) and support equipment (computers, furniture, vehicles...). At the same time, 4.5 million euros have been invested in renovation and construction of infrastructure (health stations, health centres, administrative buildings).